I had similar feelings seeing Mary Robinson last week at the Galway Arts Festival. The event was billed as Mary Robinson in conversation with Fintan O’Toole so the atmosphere was one of an evening among friends. The sound that greeted the pair when they emerged on stage at the Town Hall Theatre told a story in itself. A huge roar arose — applause, whoops and cheers. It was a wave of gratitude, affection and admiration for a woman who many of us regard as a hero, but also an expression I think of our hunger. We yearn for leaders with ethical vision, leadership skills, and courage in the face of injustice. We have so few of these (with our President Michael D. Higgins a notable exception). Seeing Mary Robinson reminded us of the best of us, what we have and also what we lack. During her remarkable career as a constitutional lawyer, human rights campaigner, Senator, Ireland’s first female President, and the United Nations High Commissioner for Human Rights, Mary Robinson developed a reputation for fearless leadership. As she said last week, she never had a problem confronting bullies. She did that “growing up with four brothers” in Mayo and throughout her student days at Trinity College, as well as in Irish public life and on the world stage. As UN High Commissioner for Human Rights she voiced forthright criticism of human rights abuses following the events of 9/11 and the invasion of Iraq — and received harsh criticism. She told us that one of her colleagues remarked at the time that she might lose her job for speaking out, to which she replied: “It’s better to do this job then to try to keep this job.” Mary Robinson stepped down from her position at the U.N. in 2002. For the past decade, Mary Robinson has devoted her passion, her intellect and her considerable energies to educating about and addressing our most serious global problems – racism, human rights abuses, child marriage and climate change. She is a founding member of The Elders (“one of the younger ones”, she wryly remarked) and founder of the Mary Robinson Foundation — Climate Justice. Her greatly anticipated memoir Everybody Matters will be published in September 2012. 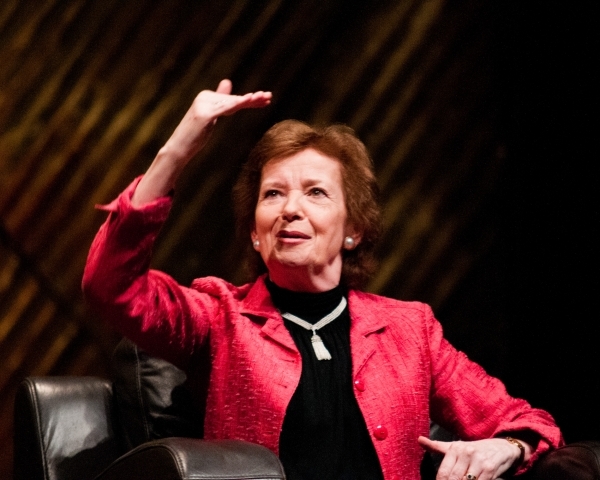 During the wide-ranging conversation with Mary Robinson in Galway, Fintan O’Toole asked her about emigration, racism, her Presidency and her more recent global work. Emigration from Ireland, across generations, has deeply affected our national psyche, she said. In ways, “emigration is our psyche”. It “hardens us” but also contributes to traits such as our humour, resilience and adaptability. Of xenophobia and racism, however, Mary Robinson was unequivocal. Racism is the human rights issue of our time, she said. During her time as President, and since, she has been aware of racism in Ireland. Mary Robinson linked emigration and racism, saying that we must reflect on the generations of Irish who emigrated to Britain, the United States and elsewhere (my own grandparents among them). How did they or would they have felt experiencing the racist treatment which some emigrants to Ireland experience? Mary Robinson spoke most passionately about climate justice. She recounted how she has been struck over and over again, across her travels to poorer communities in Africa, Asia and South America, by the cataclysmic effects of climate change. Robinson described how her friend Constance, a small farmer in Uganda, told her that there are no longer any seasons, only cycles of drought and flash flooding. These are dramatic and recent changes which Constance emphatically described as “outside our experience”. Robinson realised that this is likely to mean 200 years of experience, as oral tradition stretches back through the generations. Mary Robinson is clear about our responsibilities in the developed world to work towards climate justice. We must reduce our reliance on oil, continue to invest in and develop renewable forms of energy, and help the developing world become climate resilient. The developing world is suffering “because of what we have done”. Of all there is to admire about Mary Robinson, her warmth and humanity shine above all else. She spoke openly last week about all she has learned throughout her public life. She spoke of her dread of public speaking when she was younger, and how she decided she had to overcome that fear in order to speak what had to be said. She learned also, during her time as President, about the importance of tone and humour. Her landmark speech to the Houses of Oireachtas in Ireland in 1995 was feted globally, particularly for her potent concept of the Irish diaspora and the light in the window at Áras an Uachtaráin. The speech was not warmly welcomed by the assembly in the House, however, and she realised that her tone was too serious: “I was too important about it”. So she learned to communicate more of herself and her humour. And from the playwright Tom Murphy she said she gained a deeper understanding of tone while “telling it true”. Today, Mary Robinson is a woman who brings all of her considerable talents to her work, along with her wonderful humanity, humility, honesty and humour. For all of this, and all she has done, she is loved and cherished. This poem, Seamus Heaney’s gift, is Mary Robinson’s message to young people. We are all connected and each of us has dual citizenship: in our own nation(s) and in the Republic of Conscience. Owning and understanding our shared values is the key to individual fulfilment, as well as the hope for our collective global future. I carried this message home like a beautifully wrapped present, a precious gift to my own children. Of course, it is a gift to us all. Mary Robinson’s words are still ringing inside me. Her words, her work, her example will continue to affect my work in the future. Today I am thinking about ways to connect my IT students with Mary Robinson’s ideas and the work of her foundation on Climate Justice. And I would be delighted to communicate with anyone thinking along these or similar lines. Finally, thanks to my dear friend Mary Loftus who joined me in Galway for this wonderful event and thanks to Sally McHugh for making contact afterward. Thanks also to Fintan O’Toole and the Galway Arts Festival, and the warm and wonderful people of Galway, for hosting and welcoming Mary Robinson in fine style. But most of all, thank you, Mary Robinson.